AlwaysFreshFish.com uses only the freshest Halibut available on the Market. 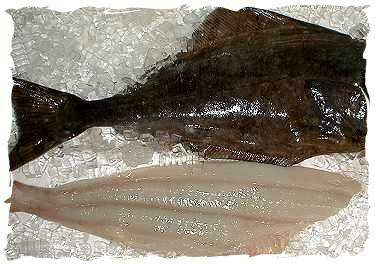 There are two types of Halibut available for consumption. The Atlantic Halibut and it's cousin the Pacific Halibut. Because of Halibut's overwhelming popularity and over fishing in the past along with its present overwhelming demand, Halibut has been placed on a regulated quota. This quota system has helped the fisherman to conserve our resources and has enabled fresh Halibut to be available almost all year. At AlwaysFreshFish.com we purchase our fresh Halibut whole and fillet the Halibut to order on a daily basis. Halibut provides us with a very mild, sweet tasting flavor. It's flesh color is white and can produce large portions of boneless white meat. Halibut fillets will dry out if they are overcooked! 1 lb. Fresh Halibut + 4 lbs. Add. Selections = 5 lb. Total Order OK! Rinse Halibut fillets under cold water and let drain. Parsley, Oregano, and Cayenne Pepper. Melt Butter. Dip Fillets into melted Butter and then into seasonings. on each side until fish blackens and flakes easily with a fork. For additional information on Fresh Halibut, please e-mail AlwaysFreshFish.com.